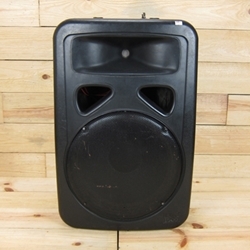 These JBL EON1500 speakers are recent consigment items at Mike's Music. Each speaker has been tested and are fully functional. There are 3 speakers available. Following in the footsteps of JBL's EON powered speakers, the unpowered JBL Eon1500 Passive Speaker provides EON portability and sound quality to those who already have a powered mixer or rack setup. 15" 2-way system features a liquid-cooled compression driver, SonicGuard protection, and rugged copolymer housing that shrugs off bumps and knocks. The JBL Eon1500 can be used as a main, tripod mounted, or as a dual-angle floor monitor.